2018 has been a fun and exciting year. There have been some excellent products from some great manufacturers that have come across my desk this year. Some have been good, others have been great. However some have been spectacular. This is to honor those spectacular products, the Editor's Choice Award recipients. As you can see, there have been some excellent products reviewed this year. We hope you have enjoyed the reviews. From us here are Stereowise Plus, Happy Holidays to you and your family. And thanks for reading! All speakers sound different from each other. The same is true of headphones. This is called sound signature or voice. To have a true reference sound, the response curve or voice would be completely flat. But this is extremely difficult to do. Now it is possible. Enter the Sonarworks True Fi. As this is a software program that is downloaded, there is no materials or build quality to rate. It’s just a matter of downloading the software onto your laptop or smartphone. So while a positive aspect is that is just a program that you download, the same can also be looked as a potential con as well. And while the software is available, it is currently only available for computers. The smartphone app has not yet been officially released, but will soon be. To use the product, you are limited to listening to music on your laptop or smartphone where the software is installed. One other con, is that it is only compatible with certain headphones. While this list is a couple hundred long and continually growing, it is still a small percentage of headphones found among listeners. Having said that, it could be used as a time to upgrade to better headphones, and get a pair that is compatible with the software. There are a couple of ways that you can use the product, depending on the quality of end result that you are looking for. If you already have a nice pair of headphones that are on the list of once supported, then all you need is the software. If you don't have a pair that is supported, then you could just buy a pair that is on the supported list, and then buy the software. But Sonarworks also does pre-calibration. So for the most accuracy, you have a couple options. You could either buy one of the models of headphones that Sonarworks sells that have actually been pre-calibrated, or you could send in your headphones to be pre-calibrated. Using the software was very simple. It was just a matter of downloading and installing the software. Once it was installed, there is a 10 day trial, and a product key when you buy the software that you would enter in. After you open the software, you enter your profile of gender and age. We naturally lose certain aspects of our hearing as we get older, and the program compensates for it. Next you enter in your make and model of headphone. For me I used a Beyerdynamic DT 1990 Pro. After this was all entered, the software was ready to use, and was as simple as clicking the engage button. Click on the button again and it disengages. So it is easy to go back and forth to see how the music sounds with it engaged vs with it disengaged. And it was also really cool to be able to see the response curve of the headphones, as well as the new flat response curve of the software once engaged, and the small increase in curve with the age adjustment figured in. Now let’s see how they sound. Being the holiday season, I turned to one of my favorite artists, Mannheim Steamroller: Christmas Celebration. I went through the various tracks one at a time, 1st with it engaged, and then with it disengaged. And did the same multiple times for each track, going back and forth. And I must say, I was very surprised with the result. I loved the sound of the Beyerdynamic DT 1990 Pro previously. But hearing the sound of the headphones with the software engaged was mind blowing. There was not a single track where I preferred the sound of the headphones without the software. There were a couple where the difference in sound was not much, but it was still improved. And there were some tracks where the sound was improved quite a bit! I was pleasantly surprised to hear that the nice big and wide soundstage that I have come to love from the Beyerdynamic DT 1990 Pro did not change. As the imaging also did not change. I was equally surprised that the overall sound without the software engaged was a bit flat and had less energy. None of the resolution, harmonics, or texture was lost with the software engaged. Yet I gained a more energetic and livelier sound. For me, the Sonarworks True Fi is a must have, and I can see most audiophiles feeling the same way. It's truly a must hear to appreciate! I’m glad to see the market for high quality music increasing, such as hi-res audio, and access to more and more of these high res downloads and streaming sites. And thanks to this software, the Sonarworks True Fi, we have a tool to make our music sound as the producer intended. Having listened to and used the software, it works as designed. It’s an amazing feat! Based on it’s design, features, quality, and performance, the Sonarworks True Fi has earned our Editor’s Choice award. If you consider yourself an Audiophile, this is a must have software, and at an MSRP of only $79 it is worth every penny! For more info and complete specs, check out their website at www.sonarworks.com. The Prepper community is growing. And with all of the natural disasters recently, floods, fires, hurricanes, earthquakes…I can see why. And some products will work for both Preppers and outdoor enthusiasts, like for a travel trailer. Up for review today is a product that will work for both. Enter the Go Power! 120-Watt Portable Solar Kit GP-PSK-120. The Go Power! GP-PSK-120 came shipped in a nice looking color printed box with photos and specs printed on the box. Opening the box revealed a well protected system held in a case. I pulled out the case and saw a well made semi hard zipper case. Opening the case revealed the solar panels were made of mostly metal with a little bit of plastic. Quality of materials used was excellent, as was the fit and finish. It is built like a tank, and would provide years of use. Also included were the owner’s manual and cables. The design of the Go Power! GP-PSK-120 is solid and extremely functional. It all fits in the semi-hard zipper case to protect it. When you pull it out, it’s impressive. It’s an efficient design. There are two panels that fold together. When they are folded together, the connectors and manual store conveniently inside. There are legs that fold down flat, one under each panel. So setting up the panels is very simple. It’s just a matter of folding the panels flat, puling out the legs, standing the panels up, and plugging in the correct connector for what the panels will be charging. And they have all your charging options covered as well. If this is for an RV that is solar charger system ready, both SAE and XLR connectors are covered. If you are charging a regular 12 volt battery, your charging options are also covered. There are ring connectors for batteries that accept ring terminals. And for these batteries that do not accept ring terminals, there are extremely high quality alligator clips. Also included is a 12 foot extension cord so you have plenty of distance to set up your panels next to the battery. I also loved the high quality heavy gauge 12/2 wire that was used throughout. All in all it’s a very simple design. There are two 60 watt panels hinged together to fold flat when used. Underneath the panels is the 10 amp charge controller. When not used the panels fold up and hold the connectors. The handle is even a solid heave gauge metal that is spring loaded to close when not in use. So far, it’s all very impressive. Let’s see how it all works. Setting it up was as easy as unfolding it, pulling out the legs, locking into place the extension cord, and then plugging in the cable with the ring terminals and connecting it to my battery. The amp charge controller quickly came to life, and I was able to go into the setting and make sure it was set for my AGM style battery. The manual was very easy to read and follow. I could see that per the manual I should be getting 14.4V (+ or -0.1V) from the solar panels to the battery. Looking up at the digital display on the charge controller it was confirmed, 14.5V. I loved that I could toggle the display to show current voltage being received, current amps, and percentage that the battery was charged. And having a USB connection on the side of the charge controller was also a nice bonus. In the end, I was very impressed with the Go Power! 120-Watt Portable Solar Kit GP-PSK-120. I can’t see how it could be built any more solidly. You should get many years of service out of it. And the panels and controller worked great together to provide the power I expected. While it's MSRP of $680 is not cheap, it can be found for less online. And given it's impeccable build quality and performance, feel it is worth every penny! Based on it’s design, features, quality and performances, the Go Power! 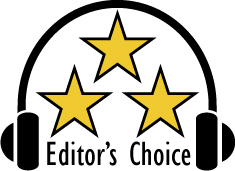 GP-PSK-120 has earned our Editor’s Choice Award. For more info and complete specs, check out their website at www.gpelectric.com. Creative is well known for their computer soundcards: the SoundBlaster line. But they also have more excellent products in their soundbar line, as well as products in their speaker line. And they are known to be great bang for the buck. This carries over to their soundbars as well. Up for review today is their Creative Stage Air. The Creative Stage Air came in a nice looking color printed box with photos and features on the box. Opening it revealed a well protected product held in place with a custom molded foam. Materials used in the construction was mostly plastic with some metal. Quality of materials used was very good, as was the fit and finish. Also included was the USB cable, 3.5 mm analog audio cable and owner’s manual. I love the design of the Creative Stage Air. It’s a small soundbar that is designed for under computer monitor use. But it also has a built-in battery, analog 3.5 mm connection, as well as Bluetooth connectivity. So while it works great under your computer monitor, it also works great anywhere. Since it has a built in battery, you can use it with your smart phone or USB flashdrive or old mp3 player with analog audio cable, and truly listen to your music anywhere! MSRP is a really low $49, and the functionality you get for the price is mind blowing! Now let’s see how it sounds. Since it is the Christmas season, I turned to a couple of my favorite songs. Mannheim Steamroller: Carol of the Bells, the bells were crisp and fairly clean, with nice resolution. The drums had nice impact and played sufficiently deep. Brass was smooth with nice pitch definition and harmonics. Mannheim Steamroller: Pat a Pan, the flute was nice and airy with better than expected resolution. Strings were crisp and clean. Drums and percussion were dynamic, with decent impact and low end extension. Sound from flat screen TV's have come a long way. But the Creative Stage Air proved to have better resolution as well as better bass response. While they did not have a whole lot of bass, they sounded good for it's size, and had better sound than I expected for it's price. The Creative Stage Air, while it has an MSRP of $49, it can be found online for even less. To be able to get this much usability and versatility is amazing at the price point. It’s also well made to provide lots of use. The Bluetooth also worked well, and was very easy to pair with my smartphone. 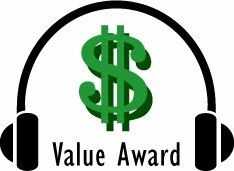 Based on it’s design, features, quality and performance, the Creative Stage Air has earned our Value Award. And it’s a perfect holiday gift for a loved one. For more info and complete specs, check out their website at www.uscreative.com.